Snag Kids Clothes For Cheap! 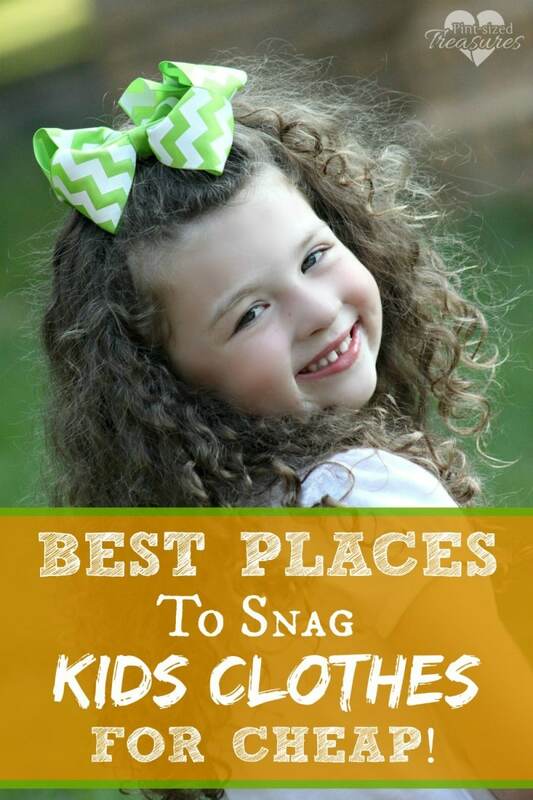 Home › Frugal Living › Best Places To Snag Kids Clothes for Cheap! With the school year in swing, and the holidays around the corner, a mom has to constantly be on the hunt for awesome deals on kids clothes. With six kids at home, I am always buying clothes — always! Yes, my kids wear hand-me downs, but kids are always growing and need some new duds every once in a while. To make your life a little bit easier, I am sharing with you some awesome places to score some kids clothes — for cheap! We’re not talking about thread-bare, stained, flimsy clothes. We’re talking about comfy, dressy, cute, clean, and stylish clothing — for cheap. Did I say cheap? Zulily. I cannot say enough about Zulily! I have visited their site many times and found UNBELIEVABLE deals for my kids — and me! Shoes are some of my favorite things to check out on Zulily. You have to join their FREE club to see their deals, but it’s worth the thirty seconds it takes to sign up. Many items are 90% off retail price! Forever 21. My girls LOVE dresses, and FOREVER 21 gives me lots of choices for under $10. Cute shirts to match for cheap-cheap! Of course I couldn’t leave this one out! Amazon is another great place to snag kids clothes for under $20. Whatever age or category you’re shopping for, make sure you type in “under $20” to see all the best deals. For example, I would type in “toddler boys clothes under $20.” Easy-peasy! Swap.com Another great place to grab some gently used clothing and have it all shipped to your front porch! It’s organized and easy to sort. You can do some consignment shopping during your child’s nap! Yard sales. This is my fave place to shop for kids clothes when I have time. Honestly, I don’t like getting up super-early to grab all the best stuff every week, so I typically wait until a HUGE neighborhood sale goes on and make a day of it. I take my kiddos along and they pick out books and a few goodies from the baked goodies stands. It really turns out to be a fun morning for everyone! Baby Leggings. Yes, this is the BEST place to grab some leggings for your babies and toddlers! You know why I know that’s true? Because you can get them for FREE! Yep, I mean it! Five free pairs — only pay shipping. But, you have to use code ENBABY at checkout or you will pay full price. So, add your leggings to your shopping cart, and then just type in ENBABY when it asks for a discount or promo code. Fun and free shopping! Hamricks family clothing. If you live in the south, you may be aware of a small chain of family lothing called Hamricks. Let me tell you, hit the clearance racks, mom! Really! I LOVE Bonnie Jean dresses for my girls. I have grabbed many high-end, aersome quality dresses at Hamricks for $15. Really. Those dresses lasted through all of my four girls, wash after wash. They are perfect for church, special occasions and holidays. If you have time, you should definitely check out clearance racks at Hamricks for your kids — and you! TJ Maxx, Burlington Coat Factory and Ross. This past summer my teen son was growing at top notch speed. I sighed as we took yet another shopping trip for khakis, polo shirts, dress shirts, ties, jeans and even shoes. This kid was needing new clothes every two months! But TJ Maxx, Burlington Coat Factory and Ross came to the rescue. I was blessed to have two of the stores only 15 minutes from my home and the other one was about a 30 minute drive. I found awesome brands I trusted — Perry Ellis, Tommy Hilfiger, Ralph Lauren and Nike for a fraction of the cost. Every week these stores get in new batches of clothes, so i tdoesn’t hurt to visit once a week. There are limited colors and sizes, but we normally hit these three stores in one shopping trip and always come back with some great finds! Dillards, Belk and Macy’s. Don’t roll your eyes at this one — just hang on a sec! There is a way to save some MAJOR dough at these stores — you just have to be a little sneaky —mmwhahaha! OK, here’s my sneaky tip. Find out when these stores are having their seasonal mark-downs and make sure you are there! My mom was able to buy one of my kids lots of shirts that were originally $30 a piece marked down to $2! It’s worth the wait, planning and trip! So, tell me frugal mom, how do YOU save money on kids clothes? Share your tips below! Want some super sneaky money saving tips for shopping for kids clothes online? Check out the ones I’m sharing at Deals Plus!